Our German program offers solid career opportunities, and we encourage our students to not only study abroad but also work and research abroad. We partner with Cultural Vistas to help students secure internships abroad in their major fields. 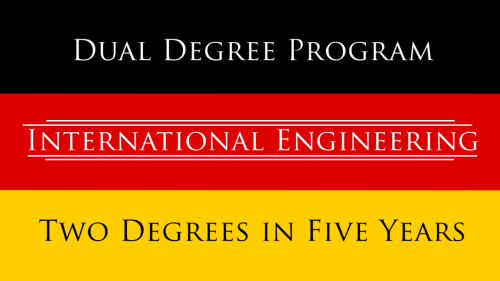 The International Engineering Program allows students to earn both a BS in engineering and a BA in German in just five years, spending their fourth year abroad studying abroad and working at a German company. It is one of only three programs of its type in the United States. We offer internationally recognized proficiency certification to all majors as an official Goethe Institute testing center, which allows our students to prove their abilities to future employers and graduate programs. In addition to traditional courses on German language and literature, we teach innovative courses aligned with faculty research that allow students to explore individual topics in greater detail such as: the German Graphic Novel, Professional German, German Cinema, Migration and National Identity, and Germany and the Holocaust: The Significance of the Holocaust in Differentiated Contexts. How is German Important Today? German is the most widely spoken language in Europe, and Germany has a long history as a high tech center that continues today. The nation is a leader in multiple fields of business and STEM, such as the automotive, biotechnology, alternative energy, pharmaceuticals, and computer science sectors, and the German economy drives the European Union. German additionally gives you access to the rich, world-renowned cultural achievements of the German-speaking countries—contributions by names such as Mozart, Bach, Beethoven, Klimt, Goethe, Kafka, Marx, Nietzsche, and Freud are among those you might recognize. German Americans are the largest heritage group in the US. Kindergarten, Christmas trees, and Levi jeans were all introduced by German-Americans. Meet our German instructors and TAs in our departmental directory. Engineering students who have combined their interests in Biomedical, Electrical, and Mechanical engineering with their skills in German. 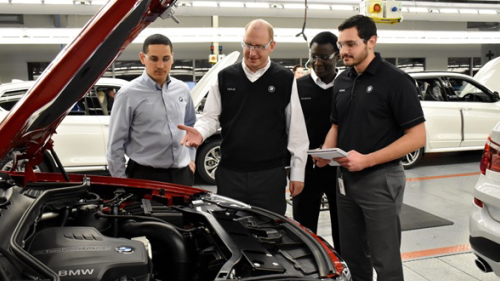 U of A Engineering student completing an internship in Germany with BMW. 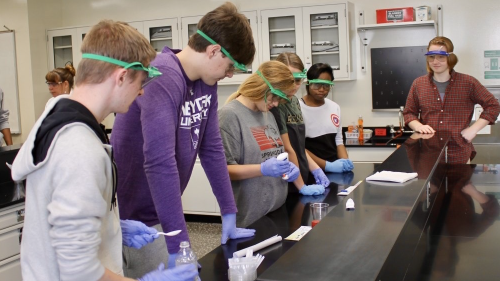 Students from six high schools across the state come to campus for a day of experiments - all in German! 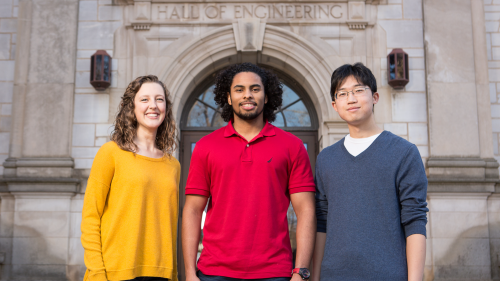 The International Engineering Program (IEP) gives students the opportunity to earn two degrees in five years—a BS in engineering and a BA in German. It is open to students in all fields of engineering. 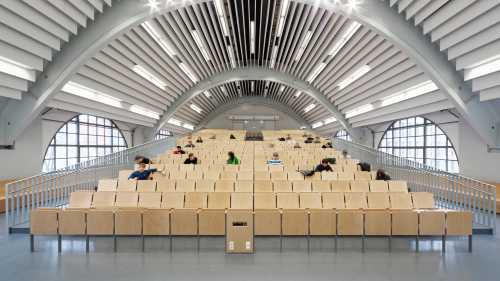 Students spend their fourth year studying abroad for a semester at the Technische Universität Darmstadt (Technical University of Darmstadt) followed by a paid internship with a German company. Interested students should review this page on the College of Engineering website for more information and application instructions. The Goethe Institut Exams are part of the European Union's Common Framework of Reference for Languages. The administration of the exams is supported by the German government in over 130 countries around the world and offers concrete proof of proficiency to future employers and graduate schools. As one of the largest testing sites in the entire southern region, our German program is able to offer students the B1, B2, and C1 exams; the B1 exam is the exam required by the German government for citizenship. Exams are held each year on a Saturday in the spring, usually April. The Arkansas Iota Xi chapter of the National German Honors Society, Delta Phi Alpha, was established in 1983. We have held an annual initiation every year since, and our membership now includes over 500 members, making us one of the most active chapters in the country. Students must have an overall B- average, a B+ average in German, be of sophomore standing or above, and have taken at least one junior level class. Students who are studying in the Walton College of Business, the College of Engineering, the College of Education and Health Professions, the Bumpers College of Agricultural, Food, and Life Sciences, and the Jones School of Architecture have another option available known as the additional major (AMGERM). It allows students to add German as an additional major by completing the 24 hours of upper level coursework (3000-5000 level classes) without having to take the other major requirements for the traditional major. So, for example, this makes it easy for students to double major in German and business, German and engineering, German and hospitality, etc. RISE is an excellent opportunity for students in biology, chemistry, physics, earth sciences and engineering to work in paid summer positions in German doctoral laboratories. A part of the DAAD (Deutscher Akademischer Austauschdienst, German Academic Exchange Service), this program is extremely competitive and open to students in all of North America and Great Britain. U of A students have done very well in this competition. The main factors in success are a high GPA and strong letters written by professors with whom the student has conducted laboratory research. Students must be sophomores to apply. Positions are available all over Germany and vary in length from six weeks to three months. German is not required since the language of the labs is English, but since students live in cities in which not all citizens can or want to speak English, at least two semesters of German are recommended. Students who have taken at least four semesters of German before participating in this program are eligible to earn three hours of conversation credit by Credit by Examination; see Dr. Condray for details. Cultural Vistas offers internships in your field with German companies during the summer months; pay varies by field, and students can apply for stipends for un-paid internships. They also have options for semester and year-long internships as well. The more German one knows, the higher the level of the placement. For example, one logistics major with a good command of German just finished an internship at BMW, and another business major received an assignment in Berlin as a manager for on-line marketing in the American market. Applications are due in December the summer before one wishes to go abroad. An opportunity to work with scholars and archivists at the Holocaust Museum in Washington, D.C. This program is open to students of all majors and generally offers typical summer student jobs such as working in a department store, at the front desk of a hotel, or stocking groceries, although there are occasionally jobs in professional fields. All positions are paid. The deadline is typically the December before one wishes to work abroad. Three to four week seminars on specific topics such as 3D printing, a start-up crash course, renewable energy, architecture, and film. There are hundreds of programs to choose from for all majors, and you can apply for stipends to help off-set the cost. For a list of courses, please visit DAAD's website here. In the fall of their senior year, students can apply to be teaching assistants for English in either Germany or Austria. These are paid positions, and assistants generally work 10 to 12 hours a week teaching. This is an excellent program and as such extremely competitive, but U of A students have done very well in this competition, receiving 19 Fulbrights or their Austrian equivalents overall. Read more about programs in Germany. Read more about programs in Austria. Fellowships available for those conducting research abroad in Germany. Students should apply in the fall of their senior year and should contact Ms. DeDe Long (dslong@uark.edu) about their application. Find more about these programs. The Humboldt foundation offers a variety of fellowships for conducting research abroad. Find out more about this fellowship. Work in the German Bundestag. Excellent language skills are a requirement, and politically active candidates have a better chance of success. Interested in Studying German at the UofA? For more information about the German Program, contact Professor Kathleen Condray.